100 years ago today, Marie Curie was awarded the Nobel Prize in Chemistry, becoming the first person to win two Nobel Prizes. The citation recognised ‘the discovery of the elements radium and polonium … the isolation of radium and the study of the nature and compounds of this remarkable element’. Isolating radium from pitchblende was a laborious process, with a ton of ore yielding only a tenth of a gram of the new substance. In the early 20th century radium was a hot commodity, with the world’s small supply in demand for scientific, medical and industrial research. 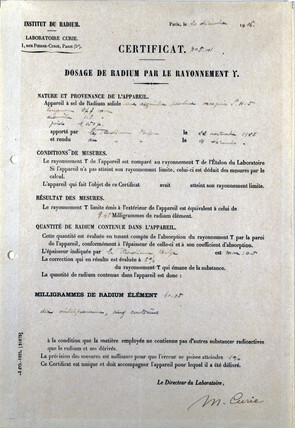 Curie established a Radium Institute in Paris to carry out research into radioactivity and continue production of radium and other substances. Certificate specifying radium content, signed by Curie in 1926 (Science Museum). 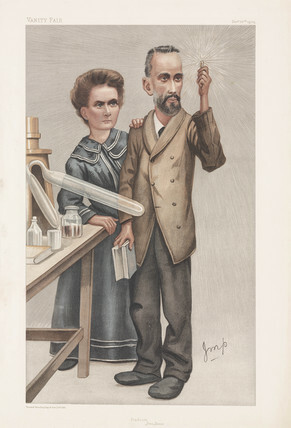 Radium’s reputation as a wonder-substance led to a public craze for radium therapies. The vast array of quack cures for sale included filters to make water radioactive, radium buttons, soap, and even toothpaste. Advert for a compress made by Radium Vita Limited which operated 1933-54 (Alison Boyle).